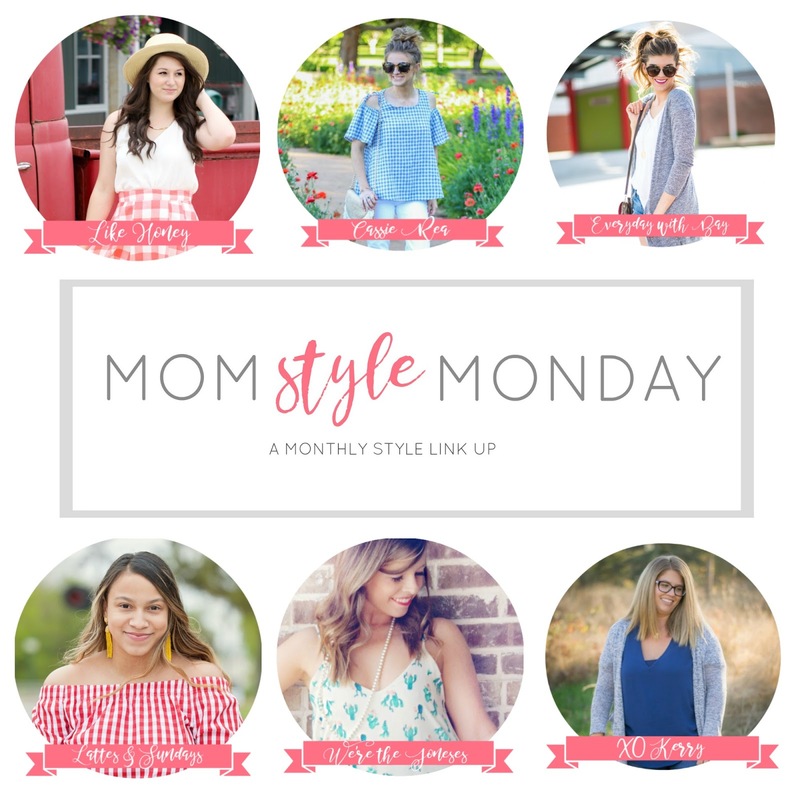 Welcome to Mom Style Monday, a monthly link party where my fellow stylish mamas share our favorite outfits and trends! There's a new theme every month, so be sure to join in next month with your own Mom Style! 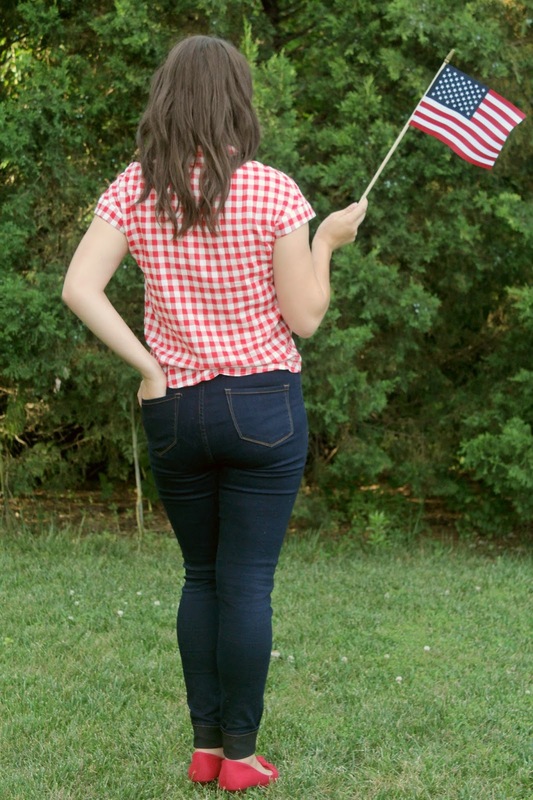 This month we're sharing our favorite Red, White, & Blue outfits to celebrate the Fourth! I am a retro lover at heart, so of course I had to add a little vintage Americana to one of my favorite holidays! These high-waisted jeans are a closet staple that will go with just about anything, from crop tops to sweaters! I love red and white gingham in the summer, so of course I had to buy this tie front beauty the second I saw it. Unfortunately it's sold out, but I've linked a few similar tops below! Oh, and is there any better accessory than freedom? It's not Fourth of July without a little bit of stars and stripes! A bold red heel (these were my wedding shoes!) and a classic crimson lip finish it off and make this pin-up worthy look perfect for your next fireworks display or family BBQ! Now it's time to link up! 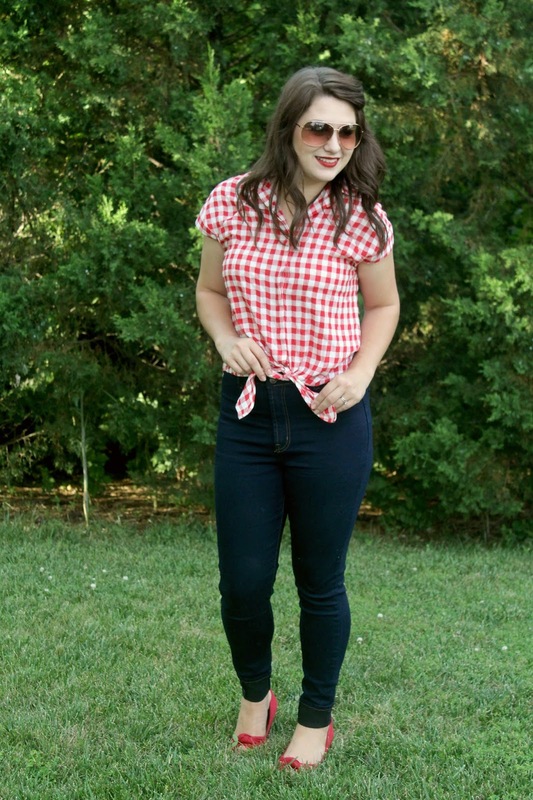 Share your favorite Fourth of July-ready look (or any recent outfit post!) and be sure to comment on at least one other blog post in the party. Then join us next month (the last Monday of every month) for a Beach Ready theme! Thank you, Caitlin! It's definitely a summer staple! Love this top! Such a summer staple print!! Thanks, Kristen! 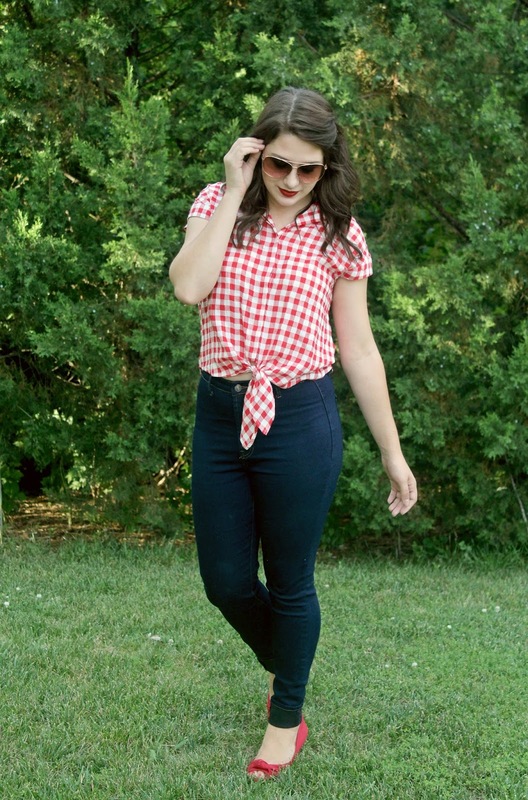 Gingham is definitely my summer go-to! Oh I just love gingham print for summer time. SO perfect for the 4th! It's a favorite of mine as well! Thanks for stopping by! 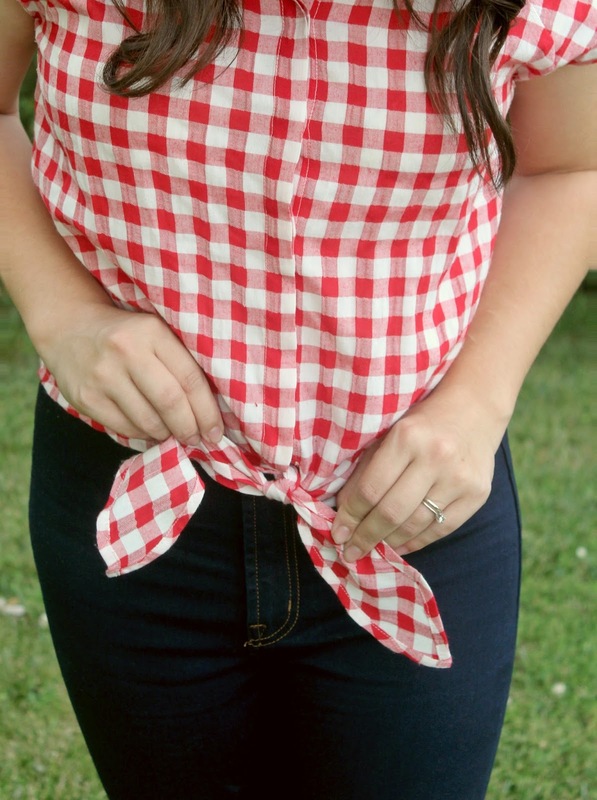 Love the gingham top! 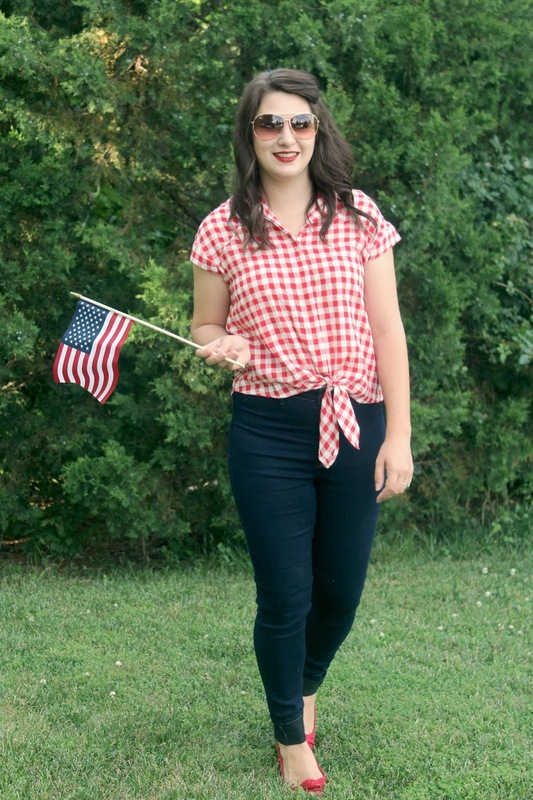 Great outfit for the Fourth of July! Thanks, doll! It's a summer staple for sure! This is the perfect ultimate 4th of July outfit.Love it. 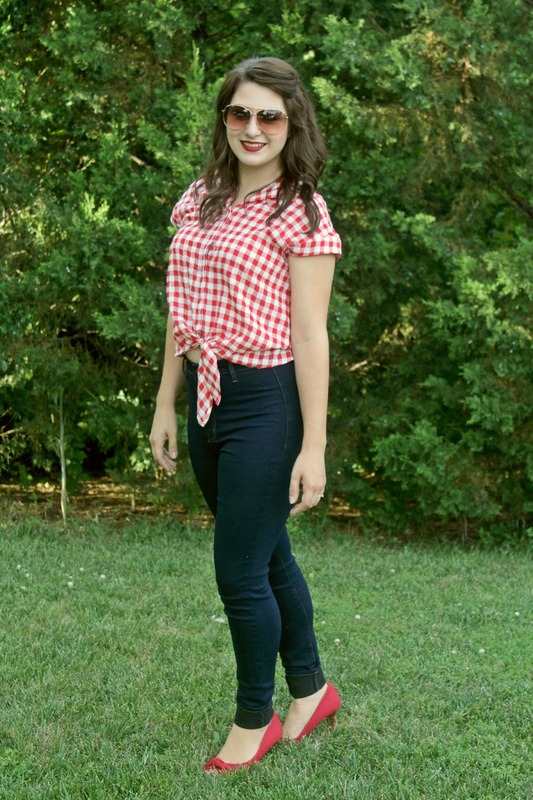 Such a cute gingham shirt. Yeay for a themed monthly linkup, too, Mariah. =) I will be sure to join it! Thanks, Ada! I actually just saw your link up the other day and will definitely link up this week!! So cute and so simple! I love how a red top and shoes can pair to make a pair of jeans look so classy! Thanks, Virginia! Red is such a fun color to elevate any outfit! You are so ready for the fourth!! 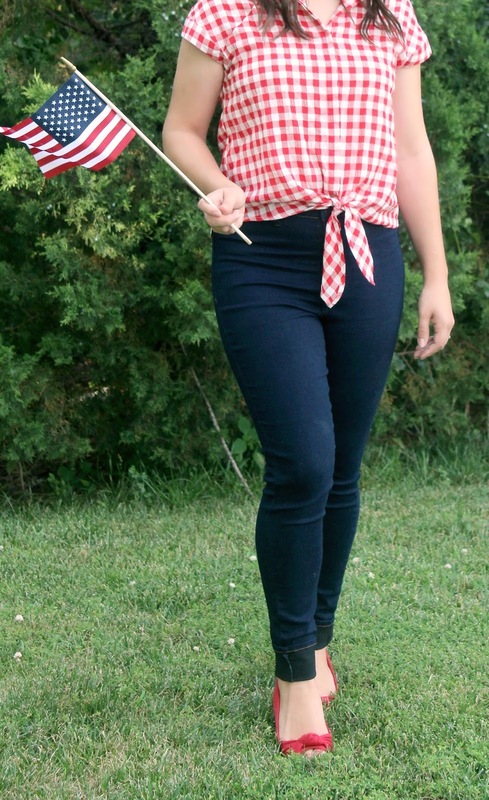 Love this patriotic look, your top is divine! Thanks Elise! I will definitely be wearing it throughout fall, as well! Perfect outfit. Greetings from Brazil. I'm a Southern Brazilian fashion blogger. God bless America! Thanks for stopping by, Aline! Such a cute outfit! 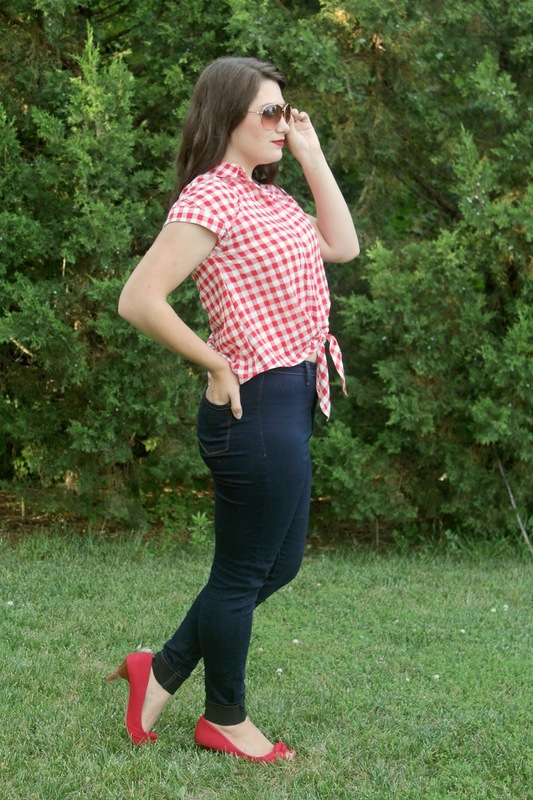 I love the gingham and those red flats! Happy 4th early! Thanks, Ruth! They were my wedding heels so I love getting new chances to take them out for a spin!